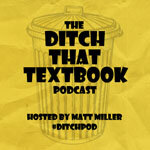 The Ditch That Textbook Podcast is the newest podcast to join the Education Podcast Network as of March 2018. We're excited to offer a unique daily podcast from Matt Miller, co-host of the Google Teacher Tribe Podcast. Helping you teach with less reliance on the textbook through technology, creativity, and innovation. Hosted by Ditch That Textbook author Matt Miller. Matt Miller is a teacher, blogger, and presenter from West Central Indiana. He has infused technology and innovative teaching methods in his classes for more than 10 years. He is the author of the book Ditch That Textbook: Free Your Teaching and Revolutionize Your Classroom and writes at the Ditch That Textbook blog about using technology and creative ideas in teaching. He is a Google Certified Innovator, Bammy! Top to Watch in 2016, and winner of the WTHI-TV Golden Apple Award. Onalytica named him one of the top 10 influencers in educational technology and elearning worldwide.